With the increasing interest in alternative milks, Alpro have been expanding their range of dairy free alternatives. Alpro Soya for Professionals is an alternative option to their Soya Original which has been formulated for use in coffee. I had no idea there was such a thing until I spotted this in my local Costcutter and couldn’t resist buying it. 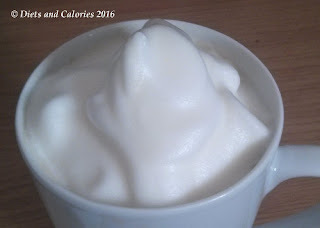 I may not be a ‘professional’ when it comes to coffee making, but I do appreciate a decent head of foam on my cappuccinos! While paying for my purchase, I queried whether this was a new product because I hadn’t seen it in any supermarkets. The vendor said he’d picked it up at the cash and carry (where they bulk buy for the shop). So I guess it’s not going to be on general sale. I make my own cappuccinos (rather than lattes to save on calories) at home with a Nespresso U, a great gadget that produces consistently good coffee. Finding a decent milk frother took many years and many purchases of various gadgets. But finally, the one I stuck with is made by Bodum as it produces excellent froth every time. This is a hand held frother. I first tried frothing the milk using my Bodum milk frother and, while it did produce a good froth, the result was similar to my regular Soya Light. However, that’s probably because I’m not heating the milk to the exactly temperature that professionals in coffee shops probably do. So I tried out my second best frothing gadget (the one my husband uses). This is called the Aeroccino and it came with the Nespresso coffee machine. However, you can buy them separately. This gadget works by heating and frothing at the same time. And this time I could really notice an improvement in my coffee froth. It was denser and very creamy. Tastewise, it’s just like Alpro’s Original Soya milk. You can buy Alpro Soya for Professionals in some branches of Costcutter and at Cost Co. Nutrition information: Per 100ml: 44 calories, 1.9g fat, 0.3g sat fat, 3.0g carbohydrates, 2.9g sugars, 0.6g fibre, 3.3g protein, 0.08g salt. Vitamins D, E, Riboflavin (B2), B12. Ingredients: Water, hulled soya beans (6.5%), Apple extract, acidity regulators (monopotassium phosphate, dipotassium phosphate), calcium (calcium carbonate), maltodextrin, sea salt, stabilizer (gellan gum). Free from dairy, gluten and wheat. Interesting, I saw this is a kosher supermarket and I wasn't aware of it before then either. They also had a coconut professional one too. Would you buy it again do you think? Hi, thanks for your comment. I think Starbucks use the professional coconut Alpro. Would I buy it again? I'd have to say no as I prefer the taste of Alpro Soya Light. But compared to the Original Alpro, the professional version does produce a better froth. My favourite is alpro soya light too!